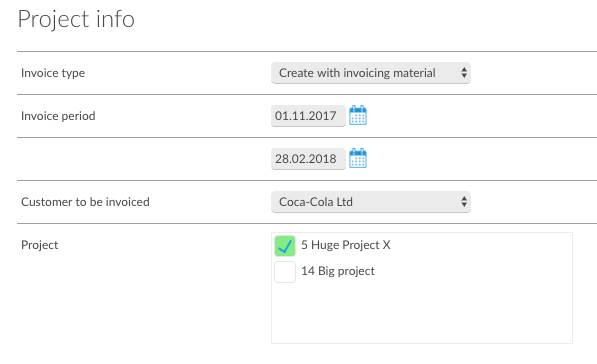 Create invoice with invoicing material. Invoice tracked hours, services, reimburse expenses and scheduled invoices in seconds. How to customise your invoice rows, to suit your needs. When you start invoicing, those materials will be enable to be collected to your final invoice. Invoice material: De-activte and define, how and what you wish to invoice from the chosen period. You can also easily edit the content of your final invoicing rows. Generate rows: Test different options to learn how you can automatically customise the rows and descriptions on the invoice.